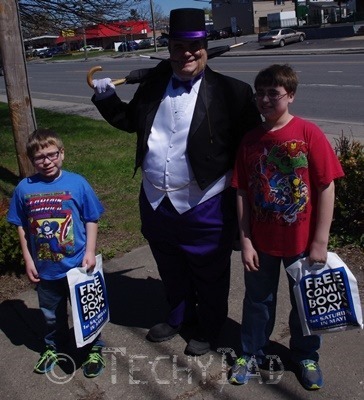 On Saturday, the boys and I went to a comic book store for Free Comic Book Day. 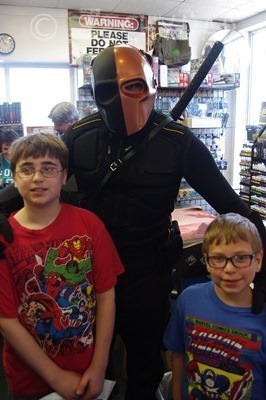 Besides free comics, a big draw for my boys I seeing superheroes or other "geeky celebrities." One year, the boys got their photo with Spider-Man, a Tusken Raider (from Star Wars), and a Stormtrooper. Another year, they met the infamous Doctor Doom. 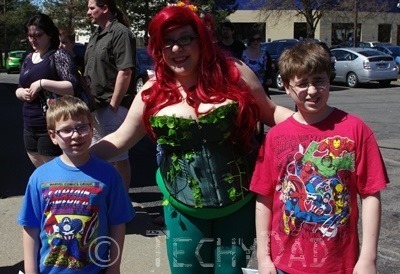 Last year, my boys got to meet Black Widow and the Joker. A couple of days before Free Comic Book Day, I had read on the shop’s web page that Harley Quinn and Poison Ivy were going to be there. Needless to say, my boys were really excited. As we approached the front of the line, out trotted the Penguin. My boys loved seeing him, but unfortunately we couldn’t get a photo of him right then. 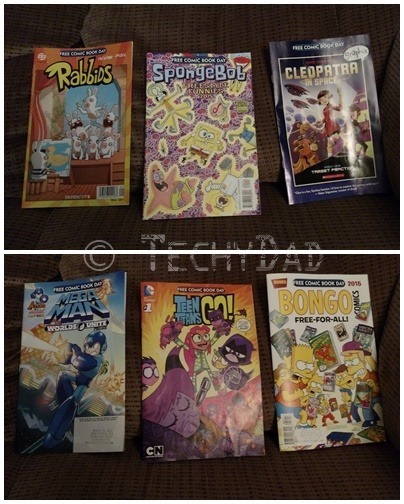 It was time to walk up the stairs and get some comic books. As we were picking our comics, we didn’t see any sign of Harley Quinn or Poison Ivy, but we did spot Black Widow again. It was great seeing her again. 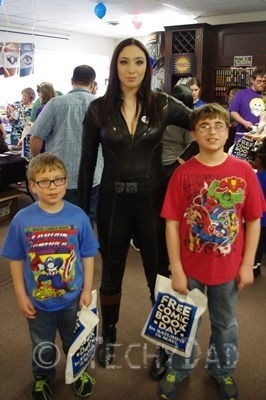 This year, it probably meant more to them meeting her as my boys have now seen all of the Marvel movies and so really know just what a great superhero Black Widow is. Even if she doesn’t have any super powers, she can hold her own against any foe. 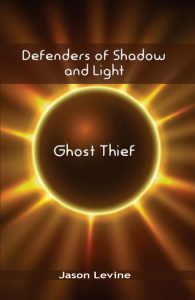 Just when you think you’ve got the upper hand on her, she reveals that she let you think that so you’d drop your guard. She’s sneaky, strong, and very smart. We were done getting our comics so we headed back downstairs and were about to walk out when HE walked in. Slade Wilson. Now, my boys know him from the Teen Titans cartoon show. Pre-Teen Titans Go!, that is, though JSL is a huge fan of that show now. JSL was so excited to get a Slade WIlson Imaginext toy from his brother on Chanukah. (He loves playing with those and will spend hours coming up with story lines and running his characters through various routines.) We just HAD to get a photo with him – but decided to leave quickly afterwards as it looked like he was itching to draw that sword. And, yes, JSL has an Imaginext Penguin figure also. It was a disappointment to not see Harley Quinn. She’s been a favorite of mine ever since Batman: The Animated Series (Mistah Jay! 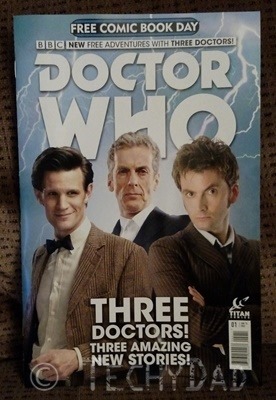 ), but we definitely can’t complain having seen such wonderful heroes and villains. 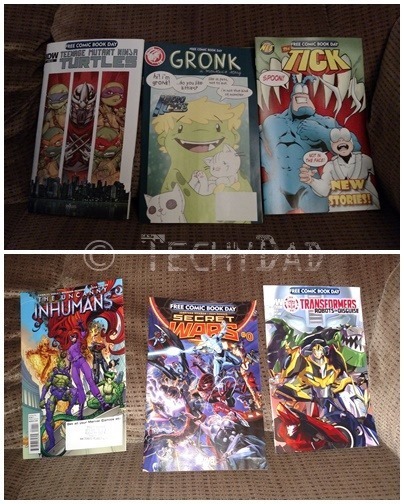 Did you go to your local comic book store for Free Comic Book Day? If so, what was your favorite part of it? Note: I did a little Internet digging to see if I could credit who played all of these great characters, but turned up empty until I looked up Poison Ivy. It looks like she’s Amanda from Undiesofwondy.com. Thanks for helping to make our Free Comic Book Day memorable, Amanda, and hope that we didn’t interrupt your podcast too much!